To really experience the benefits of herbs and spices incorporate small amounts of them into your diet on a daily basis. 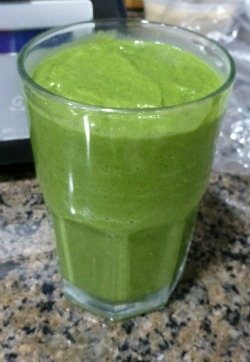 Below is your basic cilantro smoothie. I find a little cilantro plays a great supporting role in green smoothies featuring spinach and kale. Play with the add-ons or toss whatever you have on hand into your blender and create your own unique masterpiece. Enjoy! Place all of the ingredients into your high speed blender and blend for around 30-45 seconds or until nice and smooth. I’d love to know if you tried and enjoyed this cilantro smoothie – please do tell in the comments below. Happy Blending! I just tried this and LOVED it!! I added a handful of kale & turned out fantastic. The salt is key to balancing out the flavores. A smoothie I will definitely make again, thank you!! Fantastic, Amy! You’re absolutely right about the salt balancing out the flavors, I always forget to mention that. A little salt for minerals and flavor balancing. Cheers! I made a smoothing with banana, berries, spirulina and added cilantro, have to say it was pretty good!!! This is a combo I make all the time, perhaps with arugula & kale though, no ice, no salt, no oil, certainly, no honey or added sweetener. If you want it sweeter, add more ripe bananas . . . Many vitamins require a little fat for proper uptake. Sodium is a healthy electrolyte if consumed responsibly, plus adds to taste for some people. Myself = pancreatitis, non alcoholic cirrhosis of liver, gall bladder sludge and type II diabetes. Half the banana, use stevie, to reduce carb / sugars. Hurray!!! A smoothie for my extra cilantro that doesn’t require avocado or mango – never have extra avocado around the house … HELLO. Mango isn’t usually on my grocery list either. I enjoyed that! Thank you. The colour was so much what I associated with maccha, I was tempted wickedly to add a little, but then I was not bold enough. Is green tea used in smoothies? Today for the first time I incorporated cilantro in my smoothie and I have to say it was pretty good. I made it with banana, frozen berries, spirulina and added the cilantro. I tried this smoothie for the first time. All I did was add a cup of baby spinach. The rest i added exactly how the ingredient listed. I have to say this was the BEST smoothie ever! The flavors were so balanced. It was the most refreshing drink. Now I have to good use for my cilantro growing in my garden! Thanks so much!!!!!! BEST smoothie ever – I love it, Rosie! Great to hear you enjoyed this smoothie and found a good use for your cilantro. Amazing is good, Susan :) I like how you tweaked the recipe based on what you had available.